I've received several questions about how the Altadena Permit Map was created. This post will explain how it came about and how it was done. There's a lot of filming on our block. Some neighbors have said it's overused. I wondered, "Are they right? How much filming actually goes on here? Can overuse be quantified?" According to the LA County ordinance about filming permits, FilmLA is supposed to “develop records, reports, and statistical data, including but not limited to … types, and number of permits, … and area filming schedules." Since these would be public records, I thought, "why not ask for the data." In early July 2015, I requested the data for 91001 zip code from Arturo Pina of FilmLA. Without hesitation, Arturo promised to deliver the data, but that it would take a few weeks. Weeks turned to months. I pestered Arturo with nearly a dozen requests for the data. Finally, at the end of October, I received a spreadsheet. The data on that spreadsheet was woefully incomplete. It included just 100 permits for the three years span from July 2012 to July 2015. Several known permits were missing and that number was suspiciously low since it would imply there was but 1 shoot in Altadena every 3 weeks. When the missing data was called to his attention, Arturo was apologetic. He explained that the FilmLA IT department was not very capable and they had difficulty producing data for the 91001 area code. However, he said, they were continuing to work on it. A couple weeks ago, when I was building this website, I went to the Altadena Town Council Site, to find the link that now appears on the contact page. Out of curiosity, I clicked on the Altadena census tract map and there, appearing as a 'related' map, was the very map I'd been requesting from FilmLA. Random luck! Through a process I'll explain below, I extracted the data from that FilmLA map. There were over 1,400 permits listed for 21012-15. A much more credible number than 100. The new data seemed complete. I verified the data by checking a dozen known entries. This new data seem reliable. Afterall, there could only be one source. Only FilmLA has that data. I build the current map using both the October data and this new data. You can extract the data for any google map as a .kml file. You need only click on the 3-dot menu in legend and select "download KML." A KML file is an XML file that describes map decorations like boundaries, names, locations, etc. Both Google Maps or Google Earth understand KML. (In fact it's become something of an industry standard.) And since it's an XML file, the KML can be understood and loaded into Excel. There are also a numerous websites that offer tools for converting addresses to lat/lon data (i.e. Latitude/Longitude.) No special tools are required. My goal was to create a map that identified the number of permits and the permitted projects for each location and place them on google map. However, the data is messy. FilmLA uses different names for the same location. For example "2000 Acme Drive" and "2000 Acme Dr." would show up as two separate locations. Consequently, a pivot table query would result multiple entries for one location and an inaccurate picture of how many shoots occurred in a single location. In addition, about 100 entries lacked lat/lon data. Finally, Excel doesn't provide a convenient mechanism for consolidating a list of project names after the the location variants had been consolidated. I solved the consolidation issue by using the lat/lon value instead of the location name. This was not perfect because it relied on FilmLA's consistent usage of a lat/lon tool. The result was decent. Consolidating by name resulted in about 441 unique locations; consolidating by lat/long resulted in 387 unique locations. My first step was to fill in the missing lat/lon data (an annoying 2-hour process). I then did the consolidation calculation in a programing language called R which made it easy to collect all the project names for each unique location into a single text entry. While I was at it, I included a few calculations like location ranking (#1 has the most permits) and percentage of the entire sample at a single location. (#1 was responsible for 12% of the 1,400+ permits.) I wrote out the results from R to a .csv file (comma-separated-values) which could be directly loaded into Google Maps. Once in Google Maps, I was used their features to add heat map" like icons to make map easier to interpret. A nice feature of Google Maps is that when you click on an icon, you will see the 'name', 'number permits issued' and 'project names' for that location. In addition, if you click on the icon in the legend, you'll see all the locations that correspond to that icon. For example, if you click on the caret (^) next to each legend category, you'll see a list of project associated with each icon. A list of the Altadena "Special Filming Conditions"
I obtained the Altadena boundary data from the County planning website. I obtained the 91001 boundary information for the US Government Census site. I used Google earth to build boundary polygons for both the "Special Filming Condition neighborhoods and the filming areas. The Google Earth polygons and some meta data associated with each polygon was exported to a KML file and loaded into Google Maps. The data from the FilmLA map may have bugs. I've requested more information about how the map was produced. I've also requested an update with additional meta data. No word so far except for reassurances from Arturo that "they are working on it." If anyone would like more detail, please ask using the comment area below to ask. We have received a reply from FilmLA's VP for Integrated Communications, Philip Sokoloski. He has determined that FilmLA does not have the resources to filming permit data based on zip codes. Mr. Sokoloski has said they will "seek direction" from the supervisor's office to determine "what information FilmL.A. should assemble regarding on‐location filming." Meanwhile they are "unable to accommodate [my] request..."
In 2016, FilmLA did not no follow-up on the promise to 'seek direction.' 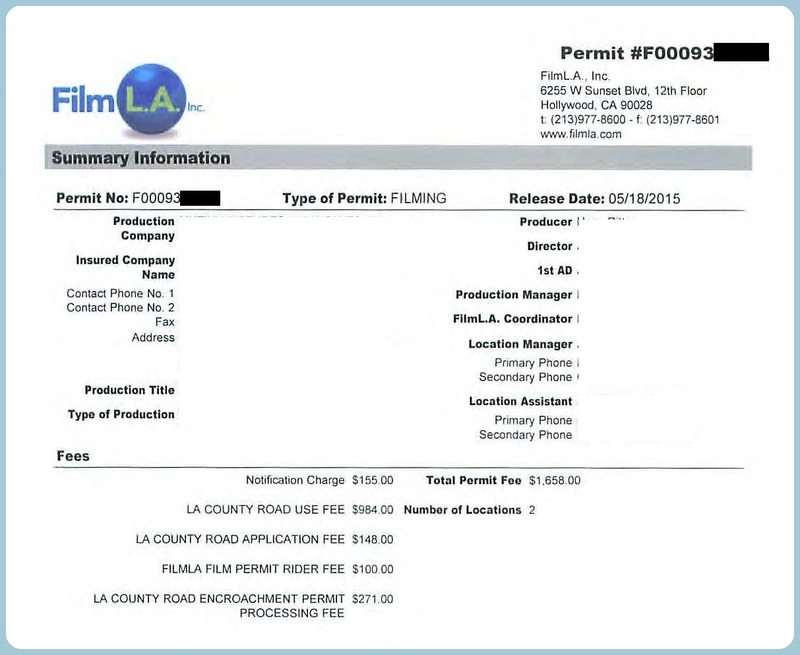 It appears that FilmLA did not act in good faith and does not intend to make filming permit data available. Since last summer I've been requesting film permit data from FilmLA. As luck would have it, I stumbled across an online map with the data I've been requesting. (I wasn't even looking!) I don't know who produced it or where it came from, but after a bit of checking, it seems very credible. Note: It appears that permit data south of New York Drive is missing. On average, 478 permits are issued on Altadena each year or about 10 permits per week. Any comments, suggestions or corrections are welcome! Want to see the original map? CLICK HERE. Don't be surprised if the link gets busted. The data may have been posted by mistake.